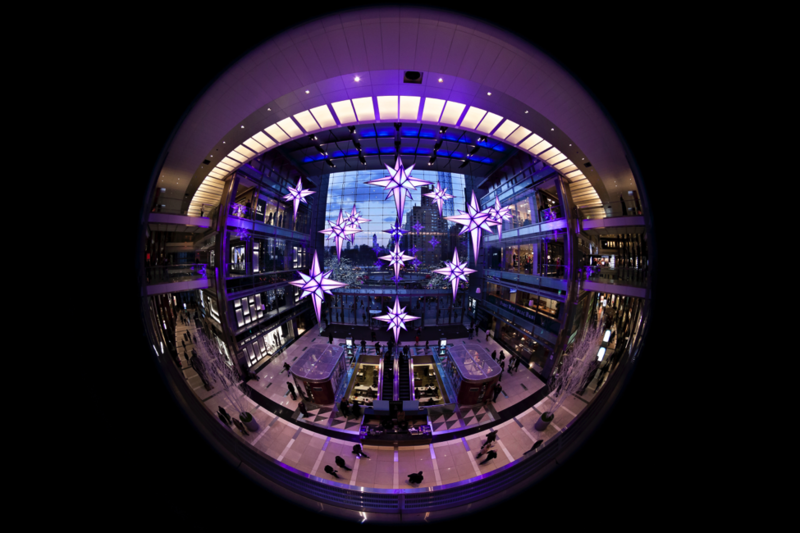 NEW YORK – November 3, 2015 – On November 12 at 5 p.m., The Shops at Columbus Circle in Time Warner Center will light its “Holiday Under the Stars,” the largest specialty crafted exhibit of illuminated color mixing in the world featuring twelve 14-foot stars that hang from the ceiling of the 150-foot Great Room overlooking iconic Central Park. The free, indoor colorful spectacle with stunning views of Central Park is an ideal destination during the cold, shorter days of winter. The destination also will offer extended shopping hours. This year, under the massive stars and through tiny doors is the world-famous Astolat Dollhouse Castle, valued at $8.5 million and built and furnished by master artisans. It features 29 rooms filled with 10,000 miniature pieces, including elaborate furniture, oil paintings, mirrors, fireplaces, gold miniature jewelry, rare-mini books more than 100 years old, fine rugs, fabrics, and pieces made of and silver and gold. This is the first ever public viewing of the famous dollhouse. The Astolat Dollhouse Castle will be on daily display on the second floor Mezzanine through December 8 during normal shopping hours. Admission to both the Astolat Dollhouse Castle and star viewing is free, courtesy of The Shops at Columbus Circle. For more on the dollhouse and specific viewing hours visit: www.astolatdollhousecastle.com. The Shops at Columbus Circle, located in Time Warner Center in the heart of Manhattan on Columbus Circle, is one of New York’s most iconic destinations and an urban oasis. It’s the place to dine, shop, live, entertain, work and be entertained. The soaring 2.8 million-square-foot landmark has transformed Columbus Circle into a cultural portal to Manhattan’s Upper West Side and Central Park.